One script and four block alphabets. Numbers to 10 and to 16. Two large and one small alphabet colored in groups of two; fourth alphabet colored in groups of four; numbers and smallest alphabet one color. Rows of alphabets and numbers separated by geometric crossbands; some geometric motifs used to fill spaces on rows of alphabets. Lower third of sampler contains two urns of free-stitched flowers surrounding large basket of fruit with side leaves. Geometric design border on all four sides. Silk embroidery thread on linen ground. STITCHES: cross, crosslet, satin, Algerian eye, rice, double herringbone, stem, four-sided. THREAD COUNT: warp 29, weft 29/in. Inscription: "[Margaret] C. Simmons Work Washington City Oct th 2 d 1827" Background: Margaret was born about 1819 to James and Mary Simmons. James is listed as a cooper, a barrel-maker, living at the Navy Yard in the 1822 Washington, D.C. directory. The court records of the District of Columbia record the marriage of Margaret C. Simmons to Patrick Dowling on May 9, 1839. In 1847 they had a son named Julius, who married Rosa M. Kuhn on January 10, 1877. Julius enlisted to serve in the Civil War in 1864 under the alias name of John Dickson. 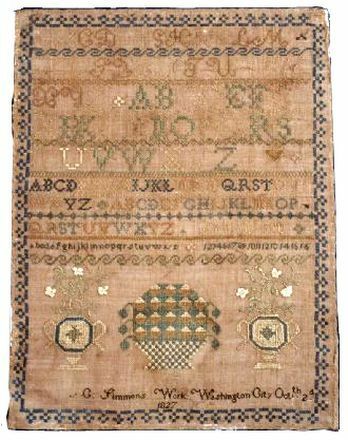 Miss Simmons's first name is missing from her sampler, but she made another sampler, typical of Navy Yard samplers, that included her whole name. Finding that sampler in a private collection made it possible to identify this sampler. Margaret died sometime after the birth of Julius in 1847, and before October 2, 1852, when her husband Patrick remarried.